Learn acoustic blues with this Guitar Tuition DVD. This great DVD will reveal all about playing acoustic blues guitar in a number of easy-to-follow tutorials, which cover a wide range of blues guitar techniques. 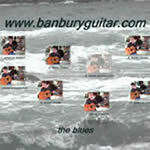 Backing tracks are included for you to jam along with to help you develop your blues guitar playing in a practical way. • What is the Blues? • Can I really play the blues with 3 chords? • What is the 12 bar progression? • What is the blues scale? • How do I jam? • What are Major or Minor Blues? • What are bar chords? • What is a shuffle? • When can I substitute chords? • What is question and answer in Blues? • When can I use 3rd/6th double stops? • What rhythms can I use? • When can I use the major scale? • How do I put it all together?